It is well known that hanwei produces very well Ninja-To’s and now they have made two new Ninja Swords and from what I have seen it is worth to have a closer look at them. Most people are excited about the Ninja Swords which are off course in many Ninja Movies and Ninja Games and maybe was their first contact with Martial Arts. I will not go more deeply in the dispute about their authentic historically relevance but will only try to find about their quality. So which Ninja Swords will we check? I have chosen between the Kouga Ninja-to, Iga Ninja-To and the Practical Shinobi Ninja-To (black same) and have a closer look at them. So all Ninja-To from Cas Hanwei (Paul Chen) are made from 1095 High Carbon steel. (1095 reflects the carbon content of the steel). 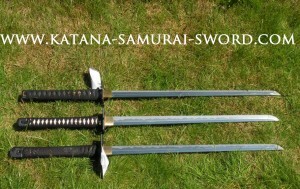 This High Carbon steel is very suitable for Swords due to their excellent properties. 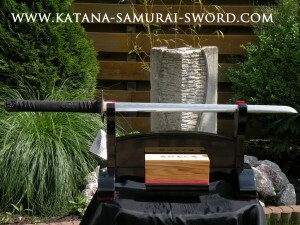 The Ninja Swords are differentially heat treated in the traditional style with clay treatment, resulting in a hardened edge for cutting and edge-holding capabilities. Also a softer body (core) for impact absorption and shock and stress tolerance. The clay treatment and heat treating process causes a hamon (temper line). The first thing what differs from the Shinobi Ninja-To and Kouga/Iga Ninja To are the packing materials. The Shinobi Ninja-To is packed in the classic polystyrene foam Hanwei box with a wrapper. The Kouga and Iga Ninja To are packed in a carton box with foam. Inside the are packed in their swordbags and a plastic bag. So when we take them out off their packaging all the swords in my opinion really have quality overall look and Hanwei’s trial to develop a Ninja Sword are well done. The second big difference between the Practical Shinobi Ninja-To and Kouga and Iga Ninja-To off course is the temperline. The Practical Shinobi Ninja-To has a straight hamon and the Kouga and Iga Ninja-To have a wavy hamon. All of them have the standard Hanwei frosty hamon (acid etched) so you cannot see the original temperline but they all show a nice prominent hamon. The third big difference is the tsuka. You cannot disassemble this Pracital Shinobi Ninja-To so the nakago is glued into the Tsuka. The Kouga and Iga Ninto are mounted with traditional bamboo mekugi (pegs) so you can disassemble this Ninja Sword for maintenance. 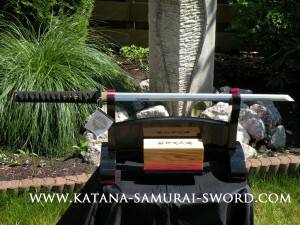 The Same (rayksin) underneath the Ito is real for the Kouga and Iga Ninja-To. 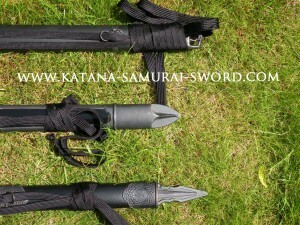 The Pracital Shinobi NinjaTo Same is fake and synthetic and the Ito (handle wrap) is synthetic suede. The Kouga and Iga Ninja To Ito is made off Japanese cotton. The Ito feels tight and feels fine for all of them. The Practical Shinobi Ninja-To shows a nice menuki, which presents a Buddhist three pronged trident. The Iga Ninja-To both have a traditional wrap and shows Clouds and Sun and Moon Menuki. I really like the finishing touch of both of them. 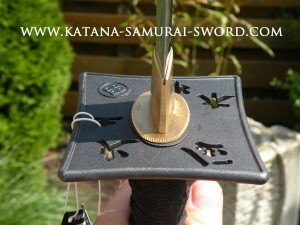 The Kouga Ninja Tsuba is blackened iron and shows the Kouga Mon and pierced Kanji. Kanji are the Chinese characters that are used in the modern Japanese writing system. 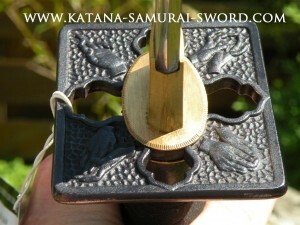 I really like the tsuba’s from all Hanwei Ninja-To’s. 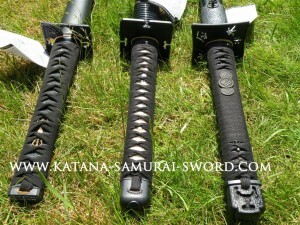 They are all made off black iron and really makes a nice Koshirae. The Practical Shinobi shows a Tsuba in the classical square ‘Ninja’ hand guard style, it really is a nice ttribute Ninja sword mystical traditions and shows ‘secret’ hand positions (kuji-kiri) used in what is effectively Japanese magic. 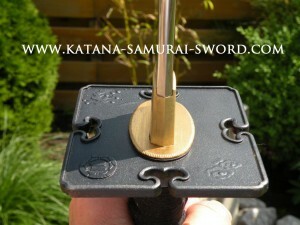 The Tsuba from the Iga Ninja-To shows a Iga mon and wave motif and feels very solid. 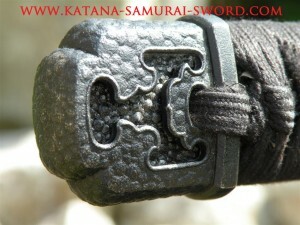 The Kouga Ninja-to tsuba features the Kouga Mon and pierced Kanji. Kanji are Chinese Characters that are used in the modern Japanese Writing System. The Habaki and Seppa (spacer betweeen tsuba, tsuka and blade) are brass and looks attractive. The Ninja-To’s which are checked by me did not show any play and feels very tight. 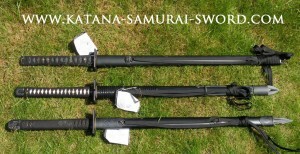 All the blades have same thinkness: +/- 6 mm the pieces I have seen, so they all are appropriate for light tameshigiri. The difference tip of the blades are very different from the Shinobi and Iga and Kouga Ninja To. 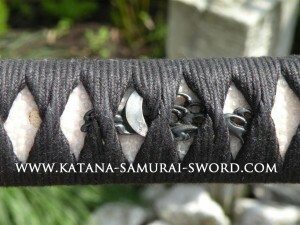 The Shinobi has a stubby point of the blade and the Kouga and Iga Ninja-To has middle sized round point. The back flat section of the blade is polished in fine mirror finish and clearly defined from the middle section. 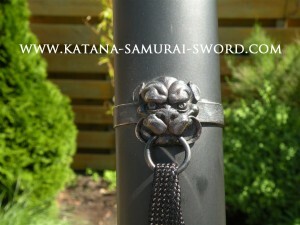 They Saya are also very attractive for all of them, the Practical Shinobi Ninja has a mystic demon head and nice finish. The Iga and Kouga both have a spike which are basicly weapons also. 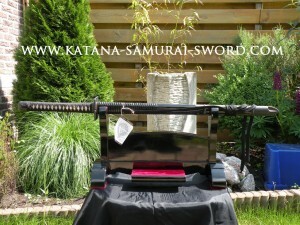 You can see them all in my webshop with some more pictures and movies, check ‘m out at www.katana-samurai-sword.com. By the way I must mention specs will slightly vary from piece by piece.